In C3 glomerulopathy (C3G), the alternative pathway of complement is frequently overactivated by autoantibodies that stabilize the C3 convertase C3bBb. Anti-C3b and anti-factor B (anti-FB) IgG have been reported in three patients with C3G. We screened a cohort of 141 patients with C3G and Ig-associated membranoproliferative GN (Ig-MPGN) for anti-FB and anti-C3b autoantibodies using ELISA. We identified seven patients with anti-FB IgG, three patients with anti-C3b IgG, and five patients with anti-FB and anti-C3b IgG. Of these 15 patients, ten were diagnosed with Ig-MPGN. Among those patients with available data, 92% had a nephrotic syndrome, 64% had AKI, and 67% had a documented infection. Patients negative for anti-C3b and anti-FB IgG had much lower rates of infection (17 [25%] patients with C3G and one [10%] patient with Ig-MPGN). After 48 months, four of 15 (26%) positive patients had developed ESRD or died. All 15 patients had high plasma Bb levels, six (40%) patients had low levels of C3, and nine (60%) patients had high levels of soluble C5b9. In vitro, IgG purified from patients with anti-FB Abs selectively enhanced C3 convertase activity; IgG from patients with anti-C3b/anti-FB Abs enhanced C3 and C5 cleavage. IgG from patients with anti-C3b Abs stabilized C3bBb and perturbed C3b binding to complement receptor 1 but did not perturb binding to factor H. In conclusion, the prevalence of anti-C3b/anti-FB Abs and alternative pathway activation is similar in Ig-MPGN and C3G, suggesting similar pathogenic mechanisms. Identification of the underlying defect in Ig-MPGN could lead to improved treatment. The complement system is a major innate immune defense mechanism that can induce host tissue damage when uncontrolled.1,2 Such uncontrolled activation of the alternative pathway (AP) of complement gives rise to kidney diseases, such as C3 glomerulopathies (C3Gs).3 Complement is frequently overactivated by C3 nephritic factors (C3NeFs). C3NeFs bind to a neoepitope on the AP C3 convertase, C3bBb, without interacting with its isolated components C3b and Bb and stabilize it.4 Classification on the basis of glomerular deposits characterized by immunofluorescence (IF) distinguishes between C3G characterized by predominant glomerular C3–containing deposits and Ig-associated membranoproliferative GN (Ig-MPGN) characterized by mesangial and subendothelial deposits of any combination of IgG, IgM, or C1q with C3.5,6 An anti-factor B (anti-FB) autoantibody has recently been identified in a patient with Dense Deposit Disease (DDD), a subtype of C3G.7 This Ab has the same capacity as C3NeF to increase the C3 convertase half-life. Combined anti-FB and anti-C3b Ab–enhancing C3 convertase activity has also been found in two other patients with DDD.8 In this study, we retrospectively screened sera from patients with C3G and idiopathic Ig-MPGN for C3b and FB Ab using ELISA. We examined the effects of the positive IgG on the C3 and C5 activation and convertase regulation. Clinical data were collected. In vitro and in vivo experimental evidence indicates that these autoantibodies may account for C3G and Ig-MPGN disorders by overactivating the AP. Plasma samples from 141 patients with C3G or Ig-MPGN and 50 healthy donors were screened for IgG reactivity against C3b and FB using a homemade ELISA assay. A positive sample was used as a standard, and the cutoff value between negative and positive samples was the mean with 2 SDs of the arbitrary units (AUs) of plasma from healthy donors. Plasma samples from 15 (15 of 141; 10%) patients were positive for anti-FB and/or anti-C3b Ab (Figure 1). Anti-FB IgG and anti-C3b IgG were detected in 12 and eight patients, respectively. Five (five of 15; 33%) patients were positive for anti-C3b and anti-FB IgG. Among the positive samples for anti-C3b, anti-C3b IgG levels were higher in the group of patients negative for anti-FB Ab. The interaction of the anti-FB and the anti-C3b Abs with their ligands was dose dependent as shown by ELISA (Supplemental Figure 1, A and B). The level of binding detected by surface plasmon resonance (SPR) correlated with the ELISA results (Supplemental Figure 1, C and D). Detection of anti-FB and anti-C3b autoantibodies. Plasma samples from patients with C3G (n=118) and Ig-MPGN (n=23) were tested. Anti-FB and anti-C3b Abs were expressed in AUs. White circles represent samples with double positivity. The cutoff of positivity was determined with plasma samples from 50 healthy donors (HDs). The clinical characteristics of the 15 patients are summarized in Table 1. Disease onset occurred during adulthood in 13 of 15 (86%) patients, with a median age of 37 years old (range =7–65 years old), and 11 (73%) of the patients were men. At the time of diagnosis on the native kidney, 13 of 14 (92%) patients with available data had a nephrotic syndrome, and nine of 14 (64%) patients had renal failure. Six of ten (60%) patients with Ig-MPGN had a history of addiction or hematologic diseases. An infectious event was in six of seven (87%) patients with Ig-MPGN with available data and two of five patients with C3G. The types of infection were tooth infection (n=3), Staphylococcus septicemia (n=2), pneumonia (n=2), and pyelonephritis infection (n=1) due to Klebsiella pneumoniae. Two patients had a history of hepatitis B infection. Among 15 patients, one had anti-CR1 Ab (patient 13), and two had anti-factor I Ab (patients 1 and 13; data not shown). The frequency of infection was significantly lower in patients negative for anti-C3b and anti-FB with C3G (17 of 68; 25%) or Ig-MPGN (one of ten; 10%). Patients with positive anti-C3b/anti-FB Ab were older at disease onset and more likely to have infection as a trigger than patients without anti-C3b/anti-FB Ab (Supplemental Tables 1 and 2). Histologic renal lesions on native kidneys at the time of diagnosis (n=14) were crescents (four of 14 biopsies), a mesangial proliferative pattern (14 of 14 biopsies), and glomerular inflammatory (14 of 14 biopsies). Inflammatory cell infiltration was significantly more frequent in patients with anti-C3b/anti-FB Ab (92%) than in those without (27%). No humps were seen. Using IF staining, ten of 15 (71%) biopsies were classified as Ig-MPGN, and five of 15 (29%) were classified as C3G. C3 and IgM staining was highly positive in most of Ig-MPGN biopsies (Supplemental Tables 1 and 3). One patient had two biopsies in 6 months: the first was classified as Ig-MPGN with similar intensity of IgM and C3, and the second was classified as C3G defined by predominant C3 depositions. 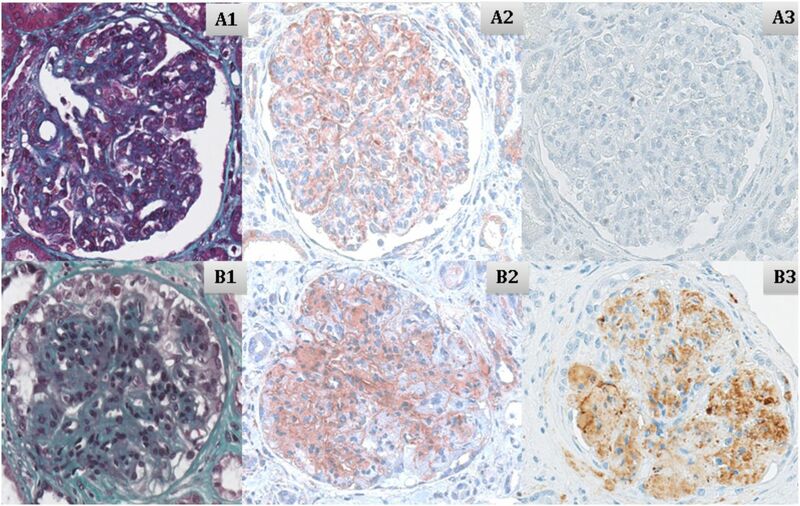 C3 and C5b9 staining was performed by immunohistochemistry on six native kidney biopsies (illustrated in Figure 2). C3 staining was positive in these biopsies and localized within the basal membrane, in the subendothelial space, or in the mesangium. The C5b9 renal biopsy staining was positive in the mesangium and the subendothelial space for the isolated anti-C3b–positive patient but negative in the five anti-FB–positive patients tested. Biopsies on native kidney from two patients. Patients with (A1–A3) isolated anti-FB (patient 12) and (B1–B3) isolated anti-C3b (patient 9). (A1 and B1) Trichrome coloration (×40), (A2 and B2) C3 staining (×40), and (A3 and B3) C5b9 staining (×40). Two patients were lost to follow-up after diagnosis. Seven of 14 patients with available data received immunosuppressive treatment. The median follow-up was 52 months (range =3–144 months). One patient with severe thrombopenia died from cerebral hematoma, and five (five of 14; 35%) were put on dialysis. Four of five combined anti-C3b/anti-FB Ab–positive patients progressed to severe chronic renal insufficiency or ESRD or died within 48 months of diagnosis. Three patients received grafts (patients 5, 14, and 15). Two of these three patients (patients 5 and 14) had severe recurrence on the graft during the first month after transplantation that resulted in graft loss. Patient 14 with anti-FB Ab lost three kidney grafts due to early recurrence. Graft biopsy analysis from the third graft, performed under preemptive eculizumab treatment, showed an increasing mesangial hypercellularity, inflammatory cells, occasional double contours, and C3 deposits in the glomeruli that increased over time persistently without C5b9 deposits (Supplemental Figure 2). At the time of the first complement assessment, six (six of 15; 40%) patients had low C3 levels (<660 mg/ml, with normal range from 660 to 1250 mg/L), with a median of 694 mg/L (range =60–1290 mg/L). The level of Bb was above the normal range in all of the patients’ samples (15 of 15; 100%), with a median of 3517 ng/ml (range =1320–17,288 ng/ml, with normal value <1275 ng/ml). The level of sC5b9 was elevated in nine plasma samples (nine of 15; 53%), with a median of 444 ng/ml (range =321–2844 ng/ml, with normal value <420 ng/ml) (Supplemental Tables 1 and 4). The patients were tested for complement biomarker analysis. C3 was decreased in three of five patients positive for the two Abs, two of three anti-C3b–positive patients, and one of seven anti-FB–positive patients. The C3 levels were significantly decreased in patients with isolated anti-C3b compared with the controls (Figure 3A). The levels of Bb in plasma were significantly higher than in the controls in the three subgroups, without difference between the subgroups (Figure 3B). Soluble C5b9 was increased in all patients positive for anti-C3b and anti-FB Ab (n=5 of 5), two of seven patients positive for anti-FB, and one of three patients positive for anti-C3b (Figure 3C). Complement activation biomarker assessments. Plasma levels of (A) C3, (B) Bb, and (C) sC5b9 of 15 anti-C3b/anti-FB–positive plasma samples and 30 healthy controls. *P<0.05; **P>0.01; ***P>0.001. 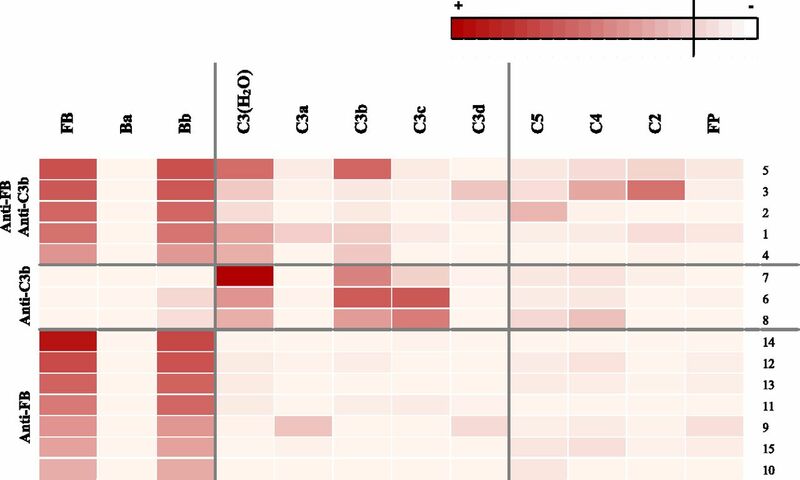 Ctr, control cohort of C3G without anti-C3b and anti-FB autoantibodies; HD, healthy donor. When available, a second plasma sample was analyzed, with the interval between the first and last samples ranging from 6 to 96 months. At the last biologic follow-up, three of ten patients had fluid-phase C3 consumption, and four of ten had increased sC5b9 (data not shown). We analyzed the reactivity of anti-FB– and anti-C3b–positive IgG against the purified C3 and FB cleavage fragments (Figure 4). Anti-FB IgG recognized the Bb fragment of the protein but did not recognize the Ba cleavage product in all patients. Isolated anti-C3b IgG recognized C3b and C3c but did not recognize the C3d cleavage fragment. In the group of patients with double positivity, anti-C3b IgG recognized C3b but did not recognize C3c. Weak reactivity toward C2 and C4 was detected in two patients, and weak reactivity toward C5 was detected in one patients but not against properdin. Epitope mapping of the anti-FB and anti-C3b IgG. Heat map showing the binding levels of patient IgG to the different antigens. The intensity of the binding is represented by red shading. FP, factor properdine. We assessed the capacity of the anti-C3b/anti-Fb Ab to influence the regulation of the AP on a cell surface expressing the natural human complement regulators MCP and DAF (but not CR1) and binding factor H (FH). Serum samples were available from four patients (one positive for anti-C3b, two positive for anti-FB, and one positive for anti-C3b/FB). When resting endothelial cells were incubated with the patients’ sera, C3 deposition on the cell surface was significantly increased compared with that in sera from healthy controls. FH-depleted serum served as a positive control (Figure 5). C3 deposition on endothelial cells. (A) Histogram of the C3 deposition on the surface of resting endothelial cells incubated with the sera from patients 3, 9, 12, and 14, which was measured by flow cytometry. Three serum samples from healthy donors served as controls. FH-depleted serum was used as a positive control for AP dysregulation. A representative histogram is shown. (B) Quantification of the C3 deposition on resting endothelial cells. *P<0.05. iso, isotype; dpl, depleted; RFI, ratio fluorescency/intensity. To find out whether the anti-C3b and anti-FB Abs were functionally relevant, their effect on the activity of the C3 convertase was tested using SPR. Purified IgG from samples positive for anti-FB Ab (n=3), anti-C3b Ab (n=2), and both of them (n=3) bound to the C3 convertase and increased its stabilization (Figure 6, A and B). The presence of IgG during convertase formation enhanced the assembly of the complex and induced stabilization in six of eight tested patients. Effects of positive patient IgG on the C3/C5 convertase of the AP. (A) Sensorograms illustrating real-time C3 convertase in the presence of positive patient IgG. After coupling C3b on the biosensor chip, we flowed a mix of FB, factor D, and IgG across it. The sensorograms of the IgG of one patient from each group (combined anti-FB/anti-C3b–, anti-FB–, or anti-C3b–positive patients) and two IgG from healthy donors (NHIgGs) and in the absence of IgG were reported as examples. C3NeF-positive IgG was used as a positive control. IgG from patient 5 (combined anti-FB/anti-C3b Ab), patient 13 (anti-C3b), and patient 8 (anti-FB) enhanced the formation of the C3 convertase. FD, factor D. (B) Calculated off rate of the C3 convertase formed in the presence of patient IgG. A lower off rate than controls signals an increased stabilization of the complexes. The effect of the IgG seemed to be related to the stabilization of the convertase, because the off rate of the triple complex is lower in the presence of IgG from our patients compared with IgG from healthy donors. Arrows indicate the Kd relative to the sensorograms shown in A. (C) Effect of positive IgG samples on the C3/C5 convertase stabilization. C3 convertase was assembled on the surface of sheep erythrocytes by incubating C3b-bound sheep erythrocytes with FB, factor D, and patient IgG. The addition of rat serum triggered lysis of cells, in which C5 lytic sites were still present after spontaneous decay. The results are expressed in percentages of residual C3/C5 convertase sites. (D) Effect on the C3/C5 activation of the depletion of anti-C3b and anti-FB Ab from two positive samples (patients 6 and 9). Depleted anti-C3b and anti-FB Ab IgG from IgG positive reduced the percentage of the C3/C5 convertases compared with total IgG, showing that they are responsible for this activity. The C3NeF sample, used as a positive control and treated as the anti-C3b IgG, maintained full activity after treatment. NH, normal human; Pt, patient; RU, response unit. P<0.05. To assess whether IgG from positive patients influenced C3/C5 convertase activity, C3bBb convertase was assembled on Ab-coated sheep erythrocytes in the presence of purified IgG from healthy donors and positive patients. IgG (from four positive patients) induced the stabilization of the C3/C5 convertase formed on sheep erythrocytes (four of 15; 26%) (Figure 6C). After anti-C3b/anti-FB Ab depletion from total IgG, the percentage of the residual C3 convertase stabilization of the same quantity of patient IgG dropped from 35% to 10% for patient 6 and from 50% to −20% for patient 9, whereas the percentage of C3 convertase stabilization remained unchanged for the C3Nef IgG subjected to the same procedure (Figure 6D). The interaction of anti-FB–positive IgG with the C3 convertases C3bBb and C3(H2O)Bb was studied by SPR. The four tested purified anti-FB–positive IgG bound to both convertases, and the binding was stronger to the C3bBb in three patients and the C3(H2O)Bb in one patient (Figure 7A, patients 13 and 14). Overall functional effect of the anti-FB–positive IgG. (A) Sensorograms illustrating real-time interaction between two examples of positive anti-FB IgG (patients 13 and 14) with C3(H2O)Bb (gray line) or C3bBb convertase (black line). Patient IgG is able to bind to its target, even when it is complexed in the convertase. 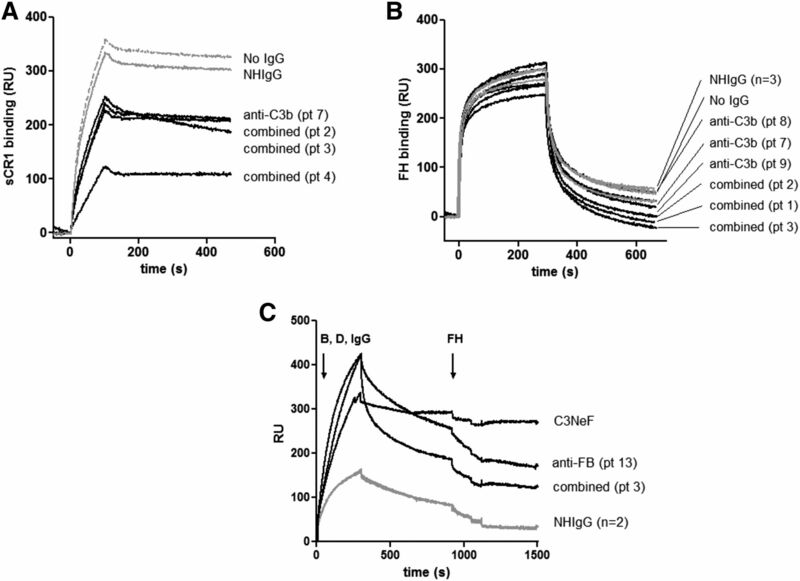 (B) Complement activation after addition of purified positive anti-FB IgG to normal human serum or IgG from healthy donors (NHIgG). Release of C3a, Bb, and sC5b9. Statistical analyses were performed by GraphPad software using a Mann Whitney test. *P<0.05. FD, factor D; NH, normal human; RU, response unit. To analyze the capacity of patient IgG to activate complement in fluid phase, six anti-FB–positive IgG samples were incubated in normal serum. The quantification of cleavage fragments reflects the activation of the C3 convertase and the C5 convertases. The levels of released Bb and C3a were increased in the presence of patient IgG compared with IgG from healthy donors. No difference was observed for the formation of sC5b9 (Figure 7B). To determine whether anti-C3b Ab binding altered the interaction of C3b to FH and CR1, C3b was immobilized on the SPR chip, and IgG purified from patients or healthy donors was flowed across the surface followed by purified FH and CR1. The presence of patient IgG did not modify the interaction of FH with C3b but resulted in a decreased capacity of C3b to bind to CR1 (Figure 8, A and B). FH dissociated the convertase formed in the presence of patient IgG as normal IgG (Figure 8C). The anti-C3b autoantibodies decreased the binding of the regulator CR1 but did not decrease the binding of FH to C3b. (A) Binding of CR1 to C3b pre-exposed to patient IgG. (B) Binding of FH to C3b pre-exposed to patient IgG. (C) Dissociation of the C3 convertase formed in presence of patient IgG by FH. IgG from a C3NeF-positive patient served as a positive control for a convertase, resistant to decay by FH. Anti-C3b–positive IgG is in black, IgG from healthy donors is in light gray, and dissociation in the absence of IgG is shown as a dashed line. IgG from a C3NeF-positive patient, stabilizing the convertase and making it resistant to FH decay, is shown as a dark dashed line. Pt, patient; RU, response unit. In this study, we report for the first time a series of 15 patients with anti-C3b and anti-FB Ab diagnosed with C3G or Ig-MPGN and show that these autoantibodies interfere with the activity of the C3 and C5 convertases of the AP of complement. We found anti-C3b and/or anti-FB Abs in fewer than 10% of our large series of patients with C3G and one half of a small cohort of patients with Ig-MPGN. The diagnosis of C3G is on the basis of a glomerular injury with membranoproliferative GN (MPGN) patterns or nonspecific alterations sharing C3-dominant glomerular staining. A better understanding of the pathogenesis of MPGN has led to reclassification into Ig-MPGN and complement-mediated MPGN.5,9 In Ig-MPGN, the Ig and complement-positive staining by IF support the hypothesis of an immune complex–mediated disease with activation of the classic complement pathway. However, growing evidence underlines the potential role of AP in Ig-MPGN. Two patients with homozygous CFH deficiency, the main regulatory protein of AP, have been diagnosed with Ig-MPGN.10,11 C3Nef was positive in 50% of patients in two large Ig-MPGN cohorts.4,12 Applying the current histopathologic definition of MPGN, ten of 14 patients in our series with available biopsy specimens were diagnosed as Ig-MPGN, because the C3 intensity of the staining evaluated by IF was identical to the other immune reactants. Our report highlights a new link between the histologic pattern of Ig-MPGN and the AP. Whatever the pathway involved in the initiation of the complement activation, the AP may play a major role in the exacerbation of the clinical phenotype of the Ig-MPGN. Interestingly, one half of our patients with anti-C3b/anti-FB Ab had a clinical history of infection and in particular, six of seven patients with Ig-MPGN and available clinical data. Infections are a well known cause of Ig-MPGN.9,13 The patients presented a background of cancer, intravenous drug addiction, alcoholism, or anorexia—well described predisposing factors to infections. This association between infection and anti-C3b/anti-FB Ab-related GN was not fortuitous: the frequency of infection was significantly lower in patients negative for anti-C3b and anti-FB with C3G (23%) and Ig-MPGN (10%). Although the origin of the autoantibodies remains unknown, they may be linked to certain infectious events, because we found similarities between the coding sequences of C3 and Streptococcous epidermidis, Streptococcous capitis, K. pneumoniae, and Shigella flexneri, although not with CFB (data not show). Infection may also initiate glomerular inflammation with the accumulation of C3 fragments, leading to the immune response against complement proteins. A recent study reported that a treatment of corticosteroids and mycophenolate mofetil could be beneficial in C3 GN.16 Anticomplement drugs, such as anti-C5, have also been shown to be effective in C3G or Ig-MPGN with highly soluble C5b9 or C5b9 depositions.17 In our series, all of the patients with infectious disease received appropriate antibiotic treatment, and immunosuppressive drugs were used in seven of 15 (46%) patients. We mapped the binding sites of the autoantibodies on their target. Interestingly, the anti-FB autoantibodies bind to the area exposed on the Bb fragment in the C3bBb complexes. In vitro, the addition of positive anti-FB IgG in normal serum increased the release of C3a and Bb but did not enhance the generation of sC5b9. In vivo, C3 and C5b9 staining in kidney biopsies revealed massive C3 staining, without detection of deposited C5b9. These results suggest a particular functional activity of these Abs, acting primarily on the level of the C3 convertase and not proceeding toward the C5 convertase. The relevance of the mechanism is illustrated by the history of patient 14. She received three grafts, because the first two were lost from recurrence. She failed to respond to a prophylactic anti-C5 therapy and lost her third graft. It would have been more effective in this patient to use an anti-C3 to block the C3 convertase. Some anti-C3b/anti FB Abs enhance the convertase formation and stabilize the C3 convertase as shown by SPR and functional assay. We showed that the functional effect is due to the Ab, because anti-C3b/anti-FB–depleted IgG did not influence the dissociation of the C3 convertase. Therefore, some anti-C3b/anti-FB Abs share the same functional consequence with C3NeF. Nevertheless, we cannot exclude the possibility that the anti-C3b and anti-FB Ab may not stabilize the convertase directly but rather, may change the binding characteristics between C3b and FB before convertase formation and/or influence the susceptibility of FB to be cleaved. More interestingly, we showed that the anti-C3b Ab perturbed the binding of CR1 to the C3b. CR1 is a specific complement regulator expressed by podocytes in the kidney. A growing body of data suggests that CR1 may be involved in the physiopathology of C3G. A recently described C3 mutation in a familial form of C3 GN was associated with decreased CR1 binding, whereas the C3 mutations found in atypical hemolytic uremic syndrome did not alter CR1 interaction.19,20 CR1 plays a major role in the elimination of the micro-organisms and the immune complexes. The interference of the anti-C3b IgG in the C3b-CR1 interaction may participate in the phenotypic expression of the disease. 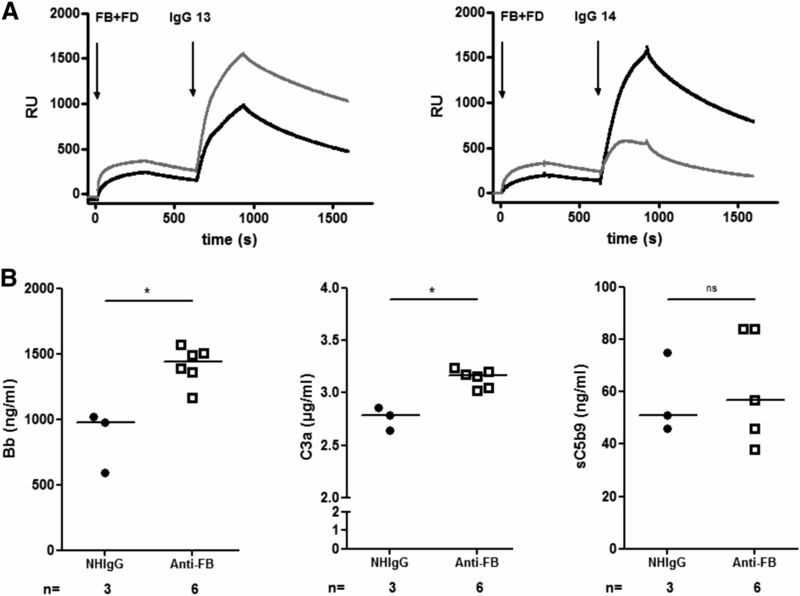 Anti-C3b Abs have been identified in patients with lupus who experience nephritic flares.21,22 In this context, IgG containing anti-C3b Ab inhibited interactions of FH and CR1 with C3b and was correlated with the disease activity. 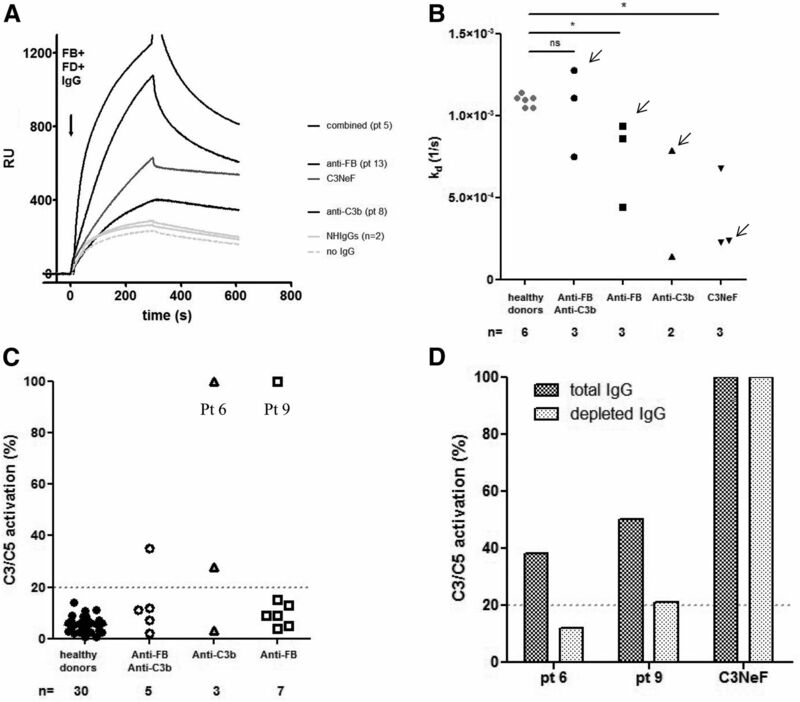 Anti-C3b Ab found in patients with C3G displays distinct properties compared with those found in patients with lupus nephritis, and this study showed the heterogeneity of autoantibodies reacting against C3b. Our study is limited due to the relatively small number of patients and by the quantity of available plasma samples to perform functional studies for all patients. However, it is the first study to evaluate the presence of anti-C3b and anti-FB Ab in patients with Ig-MPGN. The presence of anti-FB and anti-C3b Ab needs to be evaluated in a larger cohort and in particular, PIGN diagnosed in adults. The identification of these Abs could guide patient management in this setting, giving rise to a new treatment approach with anti-infectious, immunosuppressive, or anticomplement agents. One hundred forty-one patients with Ig-MPGN without coexisting disease (n=23) or C3G (n=118) referred to the Immunology Laboratory at Hôpital Georges Pompidou (Paris, France) for complement assessment were enrolled in the study. At diagnosis, the median age was 30±12 years old, 58% (75 of 129) had a nephrotic syndrome, and 35% (65 of 129) had acute renal failure. Forty percent of patients had low C3 levels (Supplemental Table 1). All of the clinical and biologic data from the patients were retrospectively collected. Renal failure was defined as a creatinine plasmatic level >150 μmol/L or a clearance of creatinine by the Modification of Diet in Renal Disease equation <60 ml/min at the time of diagnosis. Renal failure persisting for >3 months was considered chronic renal failure. The five stages of CKD are on the basis of eGFR: stage 1, >90 ml/min; stage 2, between 90 and 60 ml/min; stage 3, between 59 and 30 ml/min; stage 4, between 15 and 29 ml/min; and stage 5, <15 ml/min. Nephrotic syndrome was defined by albuminuria <30 g/L and proteinuria >3 g/24 h. Classification of histopathology patterns follows the recent C3G classification.6 Patients were classified Ig-MPGN or GC3 on the basis of pathologic IF. C3G is characterized by exclusive or predominant glomerular C3 deposits with or without dense deposits. Kidney biopsies with a similar intensity or less than two orders of magnitude difference between Ig and C3 staining in the glomeruli were classified as Ig-MPGN. All renal biopsies from anti-FB– and anti-C3–positive patients were reviewed by a renal pathologist. The renal biopsy report from the local renal pathologist was used for the control cohort. All of the patients had previously provided informed written consent for gene complement screening, complement assessment, and renal biopsies. C3 and C5b9 were analyzed for all of the patients with available paraffin-embedded native kidney or graft biopsy sections using polyclonal rabbit anti-C3d (Abcam) and anti-C9 neoepitope (gift from Paul Morgan, Cardiff, United Kingdom) as described.17 The streptavidin-biotin-peroxydase complex system was used for signal amplification. Amino-9 Etylcarbazole and 3–3′-Diaminobenzidine Biosystems Visions Kits were used for the anti-C3d and anti-C5b9, respectively. Peritumoral kidney tissue served as a negative control, and class 4 lupus nephritis served as a positive control. The screening for anti-FB and anti-C3b Ab was performed as previously described.21,22 Briefly, microtiter ELISA plates were coated with 10 μg/ml C3/C3b or FB (Calbiochem) in PBS for 1 hour followed by a blocking by PBS and 0.25% Tween 20. Plasma was diluted 1:100 in PBS and 0.05% Tween 20 and added to the wells for 1 hour. Bound IgG was revealed by an anti-human IgG Ab conjugated with HRP (Southern Biotech) diluted 1:1000 in PBS and 0.05% Tween 20 followed by the TMB substrate system. A titration curve was included on all plates in this assay using a positive plasma sample. A 1:1000 dilution of this sample was given an AU of 1000. The OD value was converted into AUs using a standard curve of reference positive plasma. A cutoff was used to qualitatively differentiate between positive and negative results. The cutoff value of positivity was determined by taking the mean +3 SD of titers using plasma samples from 50 healthy donors (130 AU/ml for anti-C3b and 170 AU/ml for anti-FB Abs). The anti-CR1 and antifactor I were screened by ELISA. Briefly, 10 μg/ml soluble CR1 or factor I was coated on the plates, and similar steps were followed as for the anti-FB anti-C3b ELISA detection. For the epitope mapping, we tested the reactivity against different C3 fragments (C3a, C3b, C3c, and C3d), FB fragments (Ba and Bb), or other complement proteins, such as C4, C5 C2, and properdin (Complement Technologies, Tylor, TX), by ELISA. All samples were tested simultaneously. Values obtained from the tested samples were displayed in a heat map, in which the intensity of the binding is represented by red (positive) to white (negative) shading. Purification of IgG was performed from the plasma of patients or healthy donors using Protein G Beads (GE Healthcare) as recommended by the manufacturer. Anti-FB or C3b IgG was depleted from the total IgG as follows. CNBr Resin (GE Healthcare) was coupled with FB or C3b following the manufacturer’s instructions. Total purified IgG was incubated for 1 hour at 4°C with the resin. After time for binding, we applied the resin to a column and collected the flow through containing IgG without IgG specific for FB or C3b. We washed the column and finally, collected purified anti-FB or anti-C3b IgG by acidic elution with Gly-HCl Ph 2.8. To ensure that the depletion had occurred, we performed an ELISA coating FB or C3b and adding total IgG or IgG present in the flow through. We revealed IgG binding as for the ELISA screening already described. The interaction of the anti-FB and anti-C3b autoantibodies with immobilized FB, Bb, C3, and C3b was analyzed in real time using ProteOn XPR36 SPR equipment (BioRad, Marne-la-Coquette, France) as described.21 The proteins (Complement Technologies) were covalently immobilized on a GLC Sensor Chip (BioRad) following the manufacturer’s procedure. Protein G–purified IgG from the positive patients or healthy donors (at 100 μg/ml) were injected for 300 seconds in PBS and 0.005% Tween 20 containing running buffer. The dissociation was followed for 300 seconds. The background signal from the noncoated surface (the interspots of the GLC Biosensor Chip; BioRad) reflecting the background binding was subtracted as recommended by the manufacturer. Because the exact proportion of the anti-C3b and anti-FB Ab in the patients’ IgG was unknown, kinetic analyses that determine the precise binding constants and affinity were unfeasible. To evaluate the stability of the formed complexes, the dissociation rate (off rates) was calculated by ProteOn Manager Software. The effect of positive IgG on the formation of the C3 convertase was studied by SPR. Protein G–purified IgG from positive patients, C3NeF-positive samples or healthy controls at 300 μg/ml, or buffer were mixed with FB at 80 μg/ml and factor D at 8 μg/ml (Complement Technologies) and injected for 300 seconds over a C3b-coated GLC chip in 10 mM Hepes, 75 mM NaCl, 1 mM MgCl, and 0.005% Tween 20 (pH 7.4) running buffer. The dissociation was followed for 300 seconds. The background signal from the noncoated surface (interspots) was subtracted. We used hemolytic sheep erythrocyte assay to detect the capacity of purified IgG to stabilize a membrane-bound C3/C5 convertase (C3bBb/C3bBbC3b). The ability of IgG from healthy donors and anti-FB Ab-positive patients to activate the complement AP in normal serum was studied. Briefly, purified IgG at 1 mg/ml final concentration was added to normal human serum diluted 1:3 in 10 mM MgCl2 and 10 mM EGTA TBS buffer and incubated for 30 minutes at 37°C. The released Bb (a measure of the amount of formed C3 convertases), the C3a (a measure of the amount of cleaved C3 molecules), and the sC5b9 (an evaluation of the capacity of the Abs to influence the terminal complement pathway) were quantified by the MicroView Bb, C3a, and sC5b9 ELISA Kits, respectively (Quidel). C3Nef-positive IgG served as positive controls. Patient or healthy donor IgG was injected at 300 μg/ml over a C3b-coated SPR chip in PBS with 0.005% Tween 20 as described before. After 300 seconds of dissociation, CFH (Complement Technologies) at 50 μg/ml or soluble CR1 (R&D) at 10 μg/ml was injected. Background signal from the interspots was subtracted by ProteOn Manager Software. The CFH or sCR1 injection was aligned at 0 RU at the moment of injection to evaluate the effect of IgG on FH and sCR1 binding. To evaluate the ability of FH to dissociate a C3 convertase formed in the presence of patient IgG, first FB, factor D, and IgG were injected as described above. After 300 seconds of spontaneous dissociation, CFH was injected to accelerate the decay. IgG from healthy donors or buffer served to evaluate normal decay. IgG from one C3Nef-positive patient with DDD served as positive control, which stabilized the convertase and rendered it resistant to decay by FH. V.F.-B. has received lecture, consultancy, and travel honoraria from Alexion Pharmaceuticals, Inc. M.L.Q. has received consulting fees from Alexion Pharmaceuticals, Inc.
We thank all pathologists for kidney biopsies analysis: Marion Rabant (Hôpital Necker, Paris, France), Laurent Daniel (Hopital La Timone, Marseille, France), Magali Colombat (Hôpital Foch, Suresnes, France), Isabelle Brocheriou (Hôpital Tenon, Paris, France), and Arnaud François (Hopital Bois Guillaume, Rouen, France). We also thank Prof. Paul Morgan (Cardiff, United Kingdom) for the gift of anti-C9 neoantigen. This work was supported by European 7th Framework Programme grant 2012‐305608 (EURenOmics) and Fondation du Rein (FDR) grant Prix 2012 FDR. This work was presented as an abstract at the 2015 15th European Meeting on Complement in Human Disease in Uppsala, Sweden, June 27–30, 2015. This article contains supplemental material online at http://jasn.asnjournals.org/lookup/suppl/doi:10.1681/ASN.2016030343/-/DCSupplemental.